“Simply Set It and Go with 150 Recipes for Intensely Flavorful, Fuss-Free Fare Everyone (Vegan or Not!) Will Devour” by Kathy Hester. This is the very first book I bought by Kathy. Before I came across her blog Healthy Slow Cooking, the only thing I used my crockpot for was jarred pasta sauce 😂. Sadly that’s a true story. Today I have 4 slow cookers and my Instant Pot has a slow cooking feature and I use them for everything except jarred sauce. There’s 8 chapters in this book. Slower cooker basics, Staples you’ll want to know: make your own bouillon, seitan, sauces and more, Simmering soups that cook while you’re away, Steamy stews and curries that save the day, Casseroles (and loaves) you wish your mother made, Easy to make pasta and grain dishes, Mouth watering meatless mains, Super easy side dishes, Sandwich, tortilla, and taco fillings, Beautiful breads NOT from your oven, Party Snacks that cook while your getting ready, Breakfast worth waking up for, Decadent desserts and delightful drinks. I never knew you could make bread and pizza in a slow cooker before I bought this book, I’ve been hooked on her recipes since then. One thing you can always count on Kathy for is easy, heathy, delicious recipes that everyone can enjoy! All of the recipes include the night before prep so all you have to do in the morning is put the ingredients in the crockpot and set the timer, go to work, run errands, or do chores- whatever you do in the day and come home to a house that smells wonderful and you have something hot and healthy to eat. It takes all of 10 mins to prep nightly. One of my cheats is to figure out what I want to make for the week, chop all the veggies on a Sunday (it’s a day I don’t have to work) and store in mason jars. Boom- 1/2 hr to an hour of prep and that’s it!! Chop veggies and store in the fridge. Put everything in the slow cooker and cook on low 6 to 9 hours. Now time for the giveaway! This is not a sponsored post. 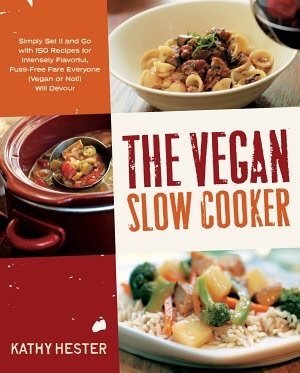 I just really enjoy this book so I’m having a new copy of The Vegan Slow Cooker book shipped to you!! Exciting right? Click HERE for the giveaway and rules. Good luck. What is the 1 slow cooker dish you want to learn how to make?